ANAHEIM, Calif. -- Against one of the best bullpens in baseball, the Los Angeles Angels treated all of the late innings like they were the ninth and the tactic was rewarded when they rallied for a 4-3 victory over the Oakland Athletics. Upton's two-run shot in the sixth inning off Oakland rookie reliever Lou Trivino proved to be the difference. Trivino (8-2), who had given up more than one earned run just once in his previous 46 outings, lost a game for the first time since June 5. It might have been the sixth inning, but Upton came to the plate with a ninth-inning mentality as the A's not only had their regular stable of relievers available, they also had newly-acquired right-hander Fernando Rodney for the first time. "They have a strong bullpen with guys that can beat you in many ways," said Upton, who admitted his plan was to attack the first strike he saw. "You play to your strengths against those guys. Just compete. Those guys are pitching well this year." "I felt like in the first inning I was a little overamped so I went back to the video room to watch some video and I was able to make the adjustments," said Pena, who had a similar slow start in his last home outing on July 29 but never made it out of the opening inning. Matt Chapman and Khris Davis each hit home runs in the first inning for the A's, who are now 13-6 since the All-Star break. Chapman hit his 16th homer while Davis' two-run shot was his 33rd. Oakland starter Brett Anderson gave up two runs on four hits with no walks, but was removed after five innings having thrown just 63 pitches. When asked if A's starters are growing accustomed to being pulled earlier than usual in favor of a strong bullpen, Anderson offered a simple "no." "It's going to take some getting used to," Anderson said. "In a tie game in the seventh the last time, you kind of see it. This one was a little early. But we've lived and died by our bullpen and those arms are tremendous down there so more times than not we're going to come out with the victory." Calhoun connected for a two-run drive in the third, his 16th of the season and 11th over his last 25 games. Calhoun's 15 home runs since June 18 lead the American League. Calhoun had just one home run and was batting .145 over 50 games when he went to the 10-day disabled list with a strained right oblique. In the 44 games since he has returned, he has hit 14 of his 15 home runs, with 34 runs scored and 35 RBI. "(The bullpen) came in and made pitches and it was a great job," Angels manager Mike Scioscia said. "After that first inning, this game could go south in a hurry when you give up a three-spot. But Felix got his bearings and the bullpen was exceptional." Rodney made his A's debut, striking out a batter during a perfect seventh inning. Rodney was acquired Thursday in a trade from the Minnesota Twins. One plan for Rodney is to use him to help ease the heavy workload on Trivino. "We won't have to potentially use Lou for more than one inning," A's manager Bob Melvin said. "We've used him quite a bit where he has to come in and clean up an inning and go back out for the next inning, which is really tough to do." Melvin says Rodney doesn't have a set role. Instead, Melvin expects to mix and match his late-inning relievers in a stacked Oakland bullpen. "More than anything, it probably allows us to not overuse a Lou Trivino, to not overuse a Yusmeiro Petit," Melvin said. "As much as we use our bullpen on certain days, we're not afraid to move guys to the back end of the bullpen if a (Blake) Treinen or (Jeurys) Familia needs time off, so it just makes us better." "His forte is to not go up there and spew accolades about himself, and I think it makes him all the more special," Scioscia said. "He was so beloved by his teammates because when he was playing, he was the best player on the planet but . never talking about himself. He was a special talent." A's: RHP Edwin Jackson (3-2, 2.87 ERA) will take the mound Saturday in the middle game of the series, carrying the sixth lowest ERA in the American League since his contract was selected June 25. 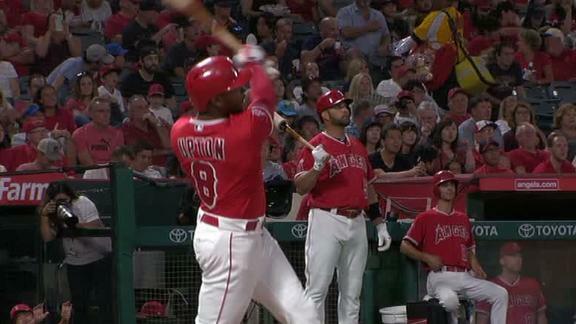 Justin Upton homers for a third straight game, his 24th of the season, giving the Angels a 4-3 lead over the A's.